The University of Iceland, UTmessa and Skýrslutæknifélag Íslands (Ský) collaborate for the exhibition of a gigantic piece of art in the form of the moon in connection with the UTmessa that takes place in Harpa concert hall and conference centre on 8 and 9 February. University staff and students take an active part in the programme. UTmessa is one of the largest IT events in Iceland and has been held annually since 2011. The event is twofold with a conference and exhibition for the IT industry open for registered participants on Friday, and an exhibition open to the public on Saturday where guests can see the various sides of the IT industry in an interactive and lively manner. 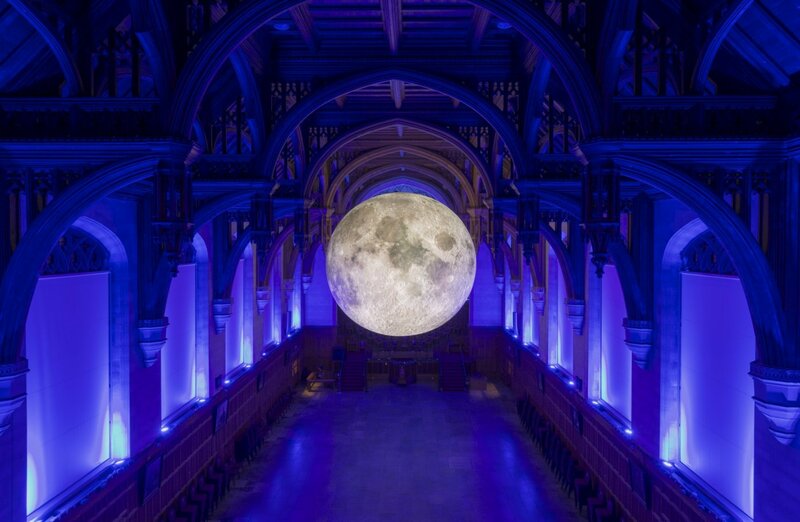 In connection with the UT event, the University of Iceland, UTmessa and Ský collaborated for the exhibition of the new touring artwork, Museum of the Moon, by the UK artist Luke Jerram. Measuring seven metres in diameter, the moon features 120dpi detailed NASA imagery of the lunar surface. At an approximate scale of 1:500,000, each centimetre of the internally lit spherical sculpture represents 5km of the moon’s surface. Inside the artwork, there are light fixtures and the moon will light up its surrounding in Harpa during the evenings. The moon rose in the twilight on Monday February 4th and will shine on visitors in Harpa and UTmessan until February 11th. This year there will be 50 years since the spaceflight Apollo 11 launched from Earth’s surface into Space and four days later the first manned spacecraft landed on the surface of the Moon. It is estimated that over 500 million people watched a live broadcast when astronaut Neil Armstrong stepped out of the lunar module and onto the Moon’s surface and declared: “That’s one small step for man, one giant leap for mankind”. Since the moon landing, development in computer and information technology has taken a giant leap forward. Bjarni Tryggvason, who is of Icelandic origin will present some of the many interesting aspects of flight in space in a special programme on Saturday 9 February. He will, furthermore, describe what is currently going on with human space flight, and provide some insight into space flight in the near future. Sævar Helgi Bragason, a connoisseur in astronomy at the University of Iceland will also take part in the special programme on Saturday where he will tell guests about what we have learned from space travel. Kári Helgason, an astrophysicist at the University of Iceland's Science Institute will also talk about the various phenomena in space and how scientists find them with the help of technology. The new touring artwork, Museum of the Moon, by the UK artist Luke Jerram will shine on visitors in Harpa and UTmessan between 4 and 11 of February. The University will also offer much more at this event. This includes the annual design competition for industrial and mechanical engineering, where participants attempt to traverse a path containing various hurdles using robots of their design. The competition is at 12 in Silfurberg, and spectators are welcomed. The organisers and participants in the Rebbot Hack hackathon, held at UI last weekend, present the event and the prize winning proposals in Kaldalón between 10 and 12. Furthermore, various innovations and interaction with curious gadgets from the University of Iceland Science Centre (Unisci) will be on offer, the FIRST Lego League Tech Competition will be introduced and the smooth ride of the engineering students in Team Spark from the University of Iceland will be on display. The event's agenda and further information on the exhibition Museum of the Moon can be found on the UTmessan website.